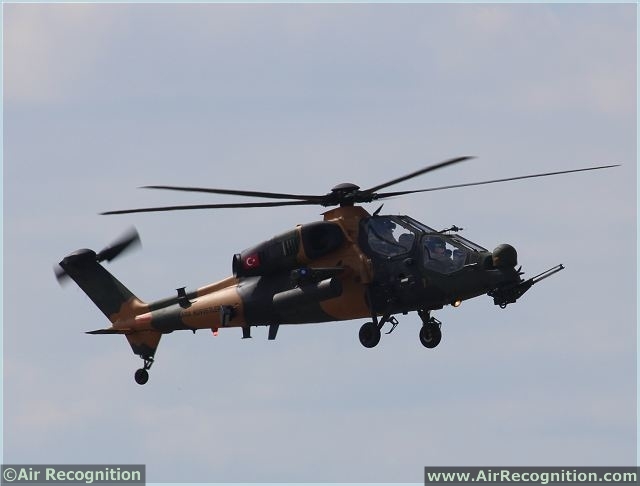 Turkish T129 ATAK combat helicopter first flight demonstration at Farnborough 2014 AirShow. Turkish Aerospace Industries T129 ATAK combat helicopter in flight demonstration at Farnborough 2014 International Airshow in United Kingdom. Late last year, the Turkish government signed up with TAI for an order of 10 ANKAs and ground stations. As part of the deal, the first serial production deliveries will take place between 2016 and 2018. Local engineers at TAI have completed production of nine helicopters since signing a contract with AugustaWestland in 2007 and five more helicopters are still being worked on. The contract comprised of the design and production of 59 helicopters worth around a total of $3.3 billion. T129 ATAK is a new generation, tandem two-seat, twin engine helicopter, specifically designed for attack and tactical reconnaissance purposes. T129 ATAK, developed from the combat proven A129CBT, incorporates totally new system philosophy with new engines, avionics, electro-optics and weapons, modified airframe, uprated drive train and new tail rotor. T129 ATAK, with the best in class power to weight ratio and optimized for "hot & high" environments, is the most efficient Attack Helicopter in the world. The T129 was optimized for hot and high conditions. It has several key improvements over the original A129 inline with the requirements of the Turkish Army. The T129 will carry 12 Roketsan-developed UMTAS anti-tank missiles (Turkish indigenous development similar to Hellfire II). It will use the more powerful LHTEC T800 (CTS800-4) engine. The T129 features a 20 mm gatling-style cannon in a nose turret. It can carry a combination of 70 mm rocket pods, Stinger air-air missile pods, and gun pods on its stub wing pylons. The T129 helicopter has a fireproof engine compartment with two low-noise LHTEC-CTS800-A4 turboshaft engines. The engines are separated, and there are two separate fuel systems with cross-feed capability. The T129 can climb at a rate of 11.3m per second. The maximum cruise speed of the helicopter is 269 km with a maximum range of 561 km.